BBC NEWS | UK | How important is cohabiting? The number of unmarried couples increased by almost 65% in the ten years to 2006, according to research from the office of national statistics. Over the same period the number of lone parent families also increased, but at a much slower rate - and the number of married couples fell by 4%. The figures from the office of national statistics offer a panoramic view of family life in the UK - now and in the past. Take a look at the headline figures and it would appear that relatively little has changed. 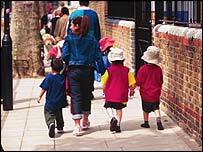 The overwhelming majority - 65% - of the 17.1 million families in the UK in 2006 were headed by a married couple. Just 12% were couples living together and 24% lone parent families. But those figures mask enormous changes in the life experiences of people of different generations in the UK. The surge in the number of people cohabiting is being driven by younger people. Figures for England and Wales suggest that by 2014 the number of people under 40 who are cohabiting will overtake the number of people of the same age who are married. Researchers compared the experiences of today's young women with their female counterparts who were young more than 30 years ago. Just a quarter of the young women interviewed had been married by the time they were 25 and fewer than a third had given birth. But the women who were young in the early 1970s had radically different experiences. By the time they were 25, three-quarters of them had been married and more than half had a child. Today's unmarried young women are much more likely to be living with a partner. Just over a fifth of the younger women in the survey had cohabited by the time they were 25 - compared to just one per cent of the older women. People who were in their late thirties in 2004 were also much more likely to be living alone than people of the same age in the early 1970s. But why does this matter? The focus on families report includes information on how different sorts of families affect mortality and health, and the wellbeing of children that provide ample food for thought. When it comes to a person's chances of dying and staying healthy, the statistics show that marriage is good for you. This is particularly true for men. A single man in his early thirties is one and a half times more likely to die than a married man of the same age. The health benefits of marriage appear to be strong for women too. Married women are less likely to suffer long term illness than unmarried women. But that advantage seems to disappear when they reach retirement age. By the time they reach their seventies, women who have never married are much less likely to die at that age than their peers who have married. This is a phenomenon researchers rather unflatteringly call the "tough old bird syndrome". The figures show that the children of married couples are more likely to stay on in education after 16 than children in other sorts of families. An important exception is for children in step families - even where the parents are married. The children of lone parents do well on this education measure. They are second most likely to be in education when they are 17. But when it comes to children's health, it seems stability could be the most important factor. Figures for 2001 show that children are much less likely to suffer long term illness if they live with both their natural parents - regardless of whether their parents are married. Children of lone mothers are much more likely to have a serious long term illness. But it must be borne in mind that lone parent families are much more likely to be poor than other sorts of families and there is a strong link between poverty and ill health.